Summary: This article describes the National Writing Project at Kent State University’s journey into the development of a sustainable Professional Writing Retreat that not only supported teachers’ professional writing but also contributed to the development of new site leadership. The goals and priorities that guided their work may serve as a helpful guide for teacher leaders planning their own writing retreats. After attending the National Writing Project Professional Writing Retreat, we returned home eager to bring a similar experience to our local site, the National Writing Project at Kent State University. We wanted to design a professional writing retreat that would support teacher-consultants as writers and, at the same time, provide an opportunity for the teacher-consultants from the first ten years of the site’s existence to reengage with the site and contribute to its leadership. reengage more teacher-consultants, especially from earlier years, in active site leadership. National retreats are located in beautiful natural settings where writers are pampered with good food, comfortable rooms, ample technology, and access to professional editors. How could we replicate the experience of an NWP writing retreat with our limited budget? This was especially challenging since Kent State University is located in economically hard-hit northeast Ohio, and the urban, rural, and even suburban schools served by the site have experienced steadily increasing expectations and decreasing material support. We set out to create a retreat design that replicated the best of the national retreat experiences and met the needs of our site without straining the site budget or asking participant teachers or districts to foot the bill. By giving participants responsibilities, we helped create a cadre of new teacher leaders. Place Matters: For people whose writing occurs almost exclusively in busy school-based lives, a change of scenery seemed essential. We located Stanford House, a hostel on the grounds of the nearby Cuyahoga Valley National Park that provided a reasonable rent ($390.00) for two days, beds for up to 20 people, a large kitchen, and a common dining room and living room. Pace Matters: While the site could only afford to rent the hostel for two days and a night, we knew that more time would be needed to build relationships and camaraderie—and to offer large blocks of time for uninterrupted writing, reflection, and response. We held an all-day pre-retreat meeting on campus at which participants were placed into writing response groups, did some facilitated free writing and read-arounds, and co-planned the remaining days of the retreat. Then, one month after the retreat, we scheduled an additional full day in the university computer lab. We understood that these writers, working with incomplete drafts, would need extended time and response in order to develop and revise their work before beginning productive work on editing. Indeed, we’ve now concluded that even more planned meeting time following the retreat would have been helpful. Without additional meetings during the school year, other matters demand teachers’ time, and support for the group trails off. Participants Matter: Following the procedures designed by the NWP for its writing retreats, we developed an invitation and application process that helped participants focus on specific writing goals and provided sufficient information for the facilitators to select participants with an eye toward diversity of grade level, school location, and ethnicity. 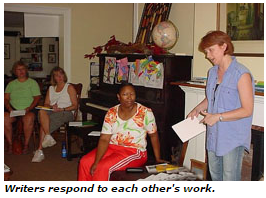 Facilitators Matter: The NWP writing retreats have shown that participants appreciate having a variety of responders available for individual response to their work. Barbara Smith, who teaches elementary/middle school in a rural county district and has published articles in national journals, worked with teachers writing about younger students and rural schools. Nancy McCracken, a published author, an editor, and a teacher at the high school and college level, helped writers seeking publication in state and national journals focused on older students. John Jarvey, a teacher-leader at the site, an active participant in the NWP Urban Sites Network, and a professional development leader in Cleveland City Schools, also served as a facilitator. We also had two site-specific goals for our site: First, we wanted to develop shared leadership, as our site would be undergoing a change of leadership in the coming year. We needed to ensure that teacher-leaders from earlier years would feel welcome and become or remain engaged in the site under its new leadership. And second, we wanted to help the site support professional writing on a regular basis. As a way of facilitating these goals, we set up volunteer committees related to the retreat. These committees planned retreat food, scouted park and hostel resources for the retreat, and made technology arrangements. Another group planned the follow-up meeting, and still another edited the interim anthology. This structure resulted in an efficiency that would not have been possible otherwise, and by giving participants such responsibilities we helped create a cadre of new site leaders—meeting our first goal. Five of the participants, in addition to the retreat facilitators, continued the following school year to serve as leaders of the site with others on our new Teacher-Consultant Council. And through this structure we set a pattern for future retreats led by teacher-consultants to continue the opportunity for writing-focused fellowship—meeting the second goal. This year, co-director Deb DeBenedictis reports that the site has sponsored its second Writing in the Woods Retreat, facilitated by participants from the recent summer institute.